I’m back at it again! 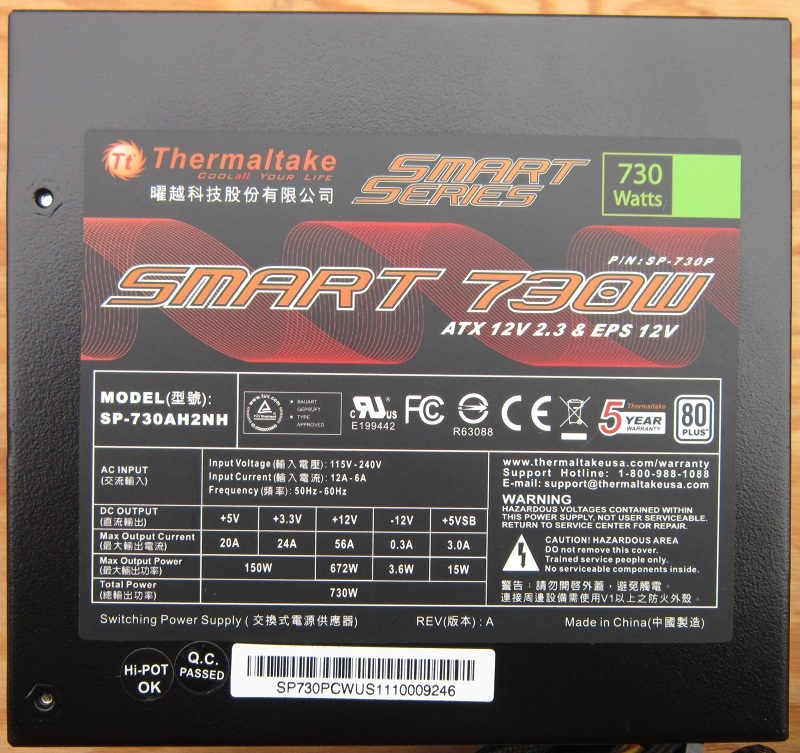 This time it’s a Thermaltake Smart 730 W PSU that I’m torturing. 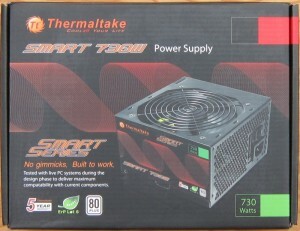 The Smart series promises solid performance for a low price. An entry level buyers dream! The question of the day is: How’s the performance? We’ll see. As usual we’ll start with the marketing. Also as usual, it comes direct from Thermaltake.com. By “as usual” I mean it usually comes directly from the manufacturer. 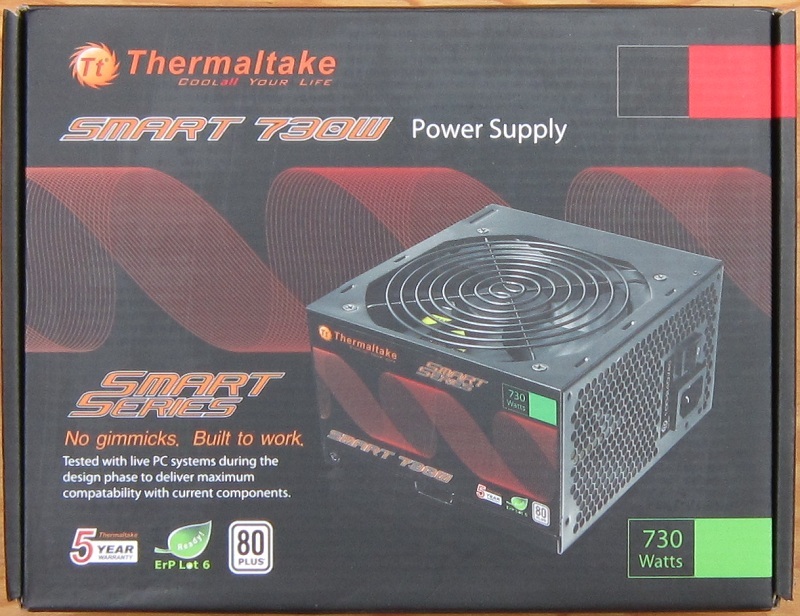 If I’m reviewing an Antec unit the info doesn’t come from Thermaltake.com. 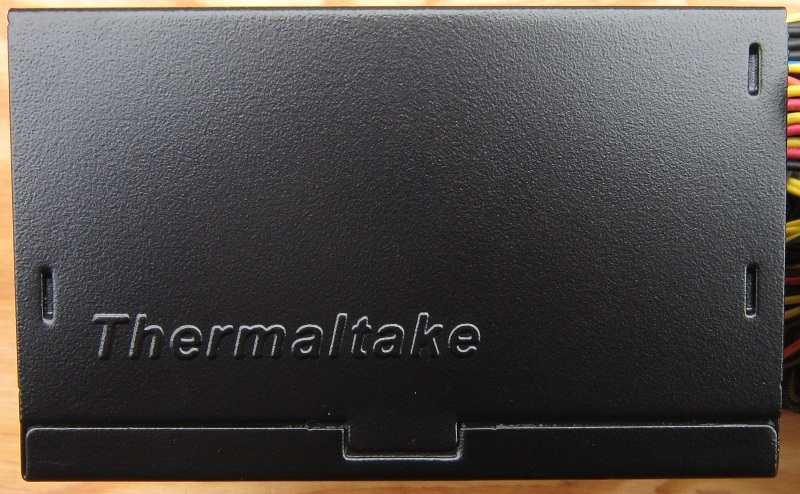 For a Thermaltake unit it does though. If you think I’m wasting your time rambling, you’re right. It could be worse though, you could be one of the editors who has to read this and check it for grammar and punctuation! Guaranteed to deliver 730 W continuous output @ 40 °C (104 °F) operating environment. 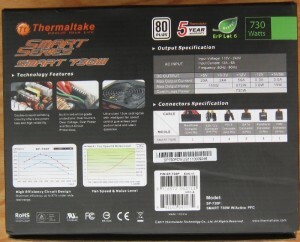 While most power supplies work well in optimal conditions Thermaltake ensures the SMART Series power supply can operate efficiently even in the higher temperatures found in the computer chassis. Robust and dedicated +12 V rail delivers up to 56 A to ensure your components get the power they need whenever they demand it. Dimension: 150 x 86 x 140 mm (W x H x L). Here we have the large block of text in which I look at the marketing and add my comments. Can you skip this? Absolutely. Should you? I have no clue. Will you regret skipping it? Maybe. In any case, 730 W at 40 °C is the first claim, that will be tested. A single 12 V rail is cheaper, but not necessarily better. 80Plus is nice, Bronze would be nicer, but 80Plus is a good start. Double forward switching was snazzy some time ago, now it’s fairly basic. It does work well, though. 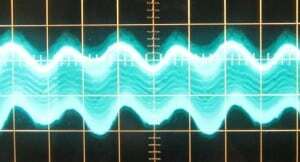 APFC is nice for your utility company and nice for you in that it can soak up small surges without issue. 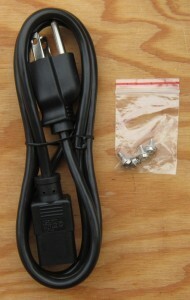 It also allows you to plug the unit into 90 VAC to 220VAC without changing a switch. It has nothing to do with the power the PSU puts out though. 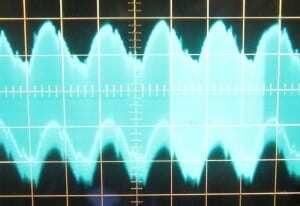 Ultra-Silent is like saying “Less Nothing!” or “More Infinite!”. 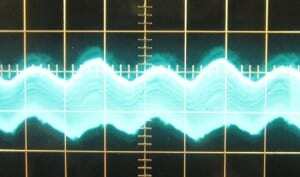 Something is either silent or it isn’t, and given that this unit has a fan it is not silent. Ultra-Quiet maybe. Compliant with All the Things! One hopes. OCP/OVP/OPP/SCP sounds nice. I’m checking SCP these days, so this unit had better hope it really has SCP. 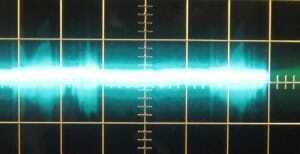 (I bridge the PCIe 12 V and GND planes in my tester). On to the specifications! Most of them, anyway. 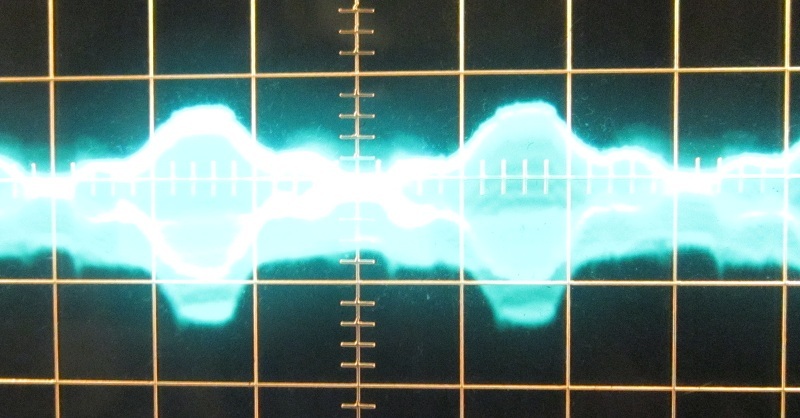 16 msec (minimum) @ 50% load at 230 Vac 50 Hz input. Ignore the peak output capacity, it’s fairly pointless. 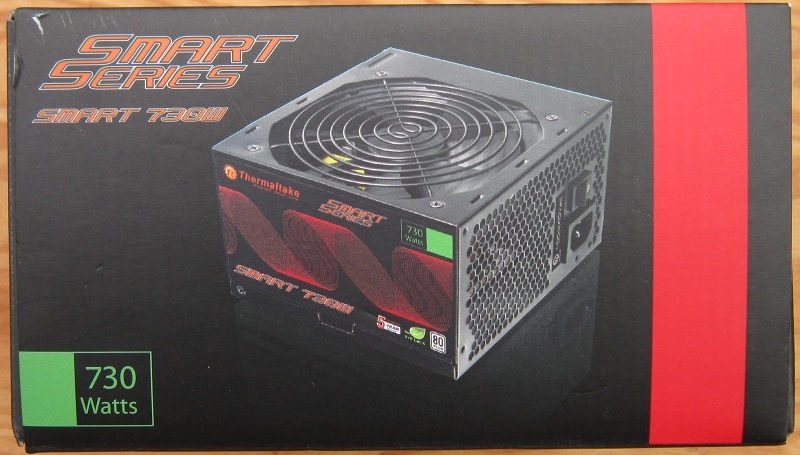 Other than that, the only thing of note here is that this is a fairly compact PSU. That’s nice. For a non-DC-DC PSU this unit can do an amazing amount of 12 V, very impressive. Actually putting out that much means a fairly heavy crossload, we’ll see how well it survives that in testing. 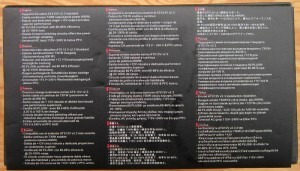 Lastly, Thermaltake gives us a chart of the protection trip points. This is quite rare and I appreciate it. I’ll also check it against the protections IC datasheet to make sure it’s correct. Look for that in the Dissection Section. The OCP trip points are reasonable, the OVP/UVP trip points are… dubious. 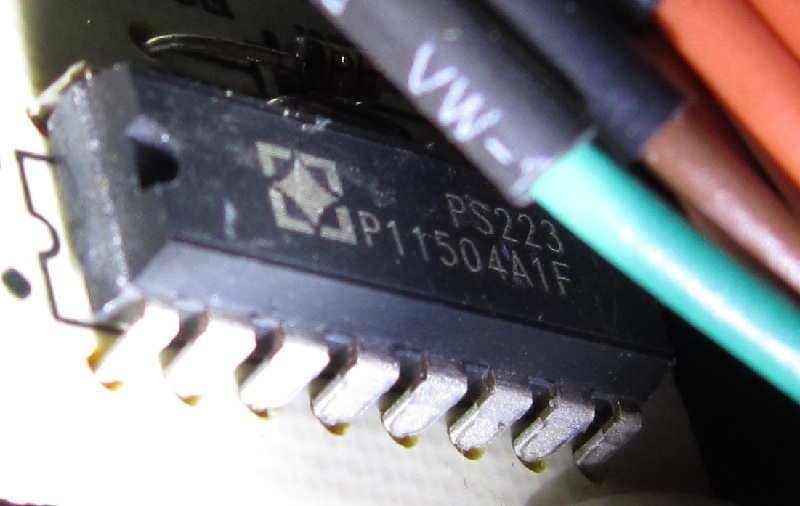 Looks like a PS232S protections IC to me (note: I have not opened the PSU yet. It’s a guessing game at this point), not my favorite, but better than nothing. Now that we’ve read all the marketing, let’s look at the marketing on the box! In these modern days of online purchasing, the outside of the box really isn’t that important. Either more computer parts are sold at brick and mortar stores than I think, or companies haven’t realized that they can stop spending so much money on packaging prettiness. Without (too much) further blathering, here’s the box. I like the box, it’s tastefully decorated without going overboard on anything. 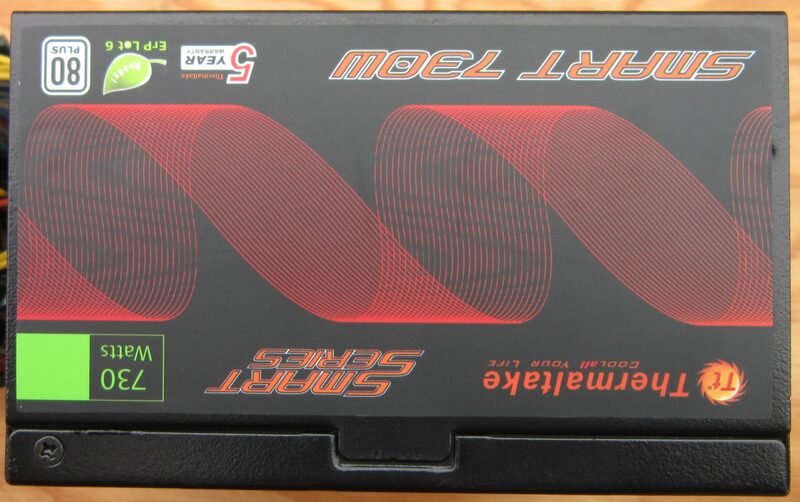 The packaging isn’t overly long on protection for the PSU, the bubble wrap does the bottom, one side and the top. Bubble wrap and cardboard does the exhaust grill, while bubble wrap and the power cable do the other side. The top gets bubble wrap and some manuals. It seems to work well enough, this is the fifth of the Smart series that I’ve looked at in my career and all have been intact after shipping. Now we get to see the PSU itself! Well, now you do. I already saw it. If you look closely at the grill shot, you can see a transient filter inductor leaning back. Either it’s dancing to a fairly terribly song from the last decade, or someone wasn’t as careful as perhaps they should have been when they installed it. We’ll look more closely in the Dissection Section. 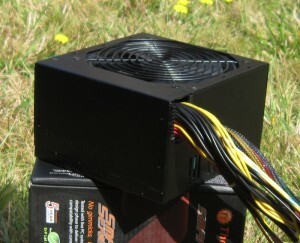 Lastly, a few angled views so you can pretend the PSU is in a RPG or something. 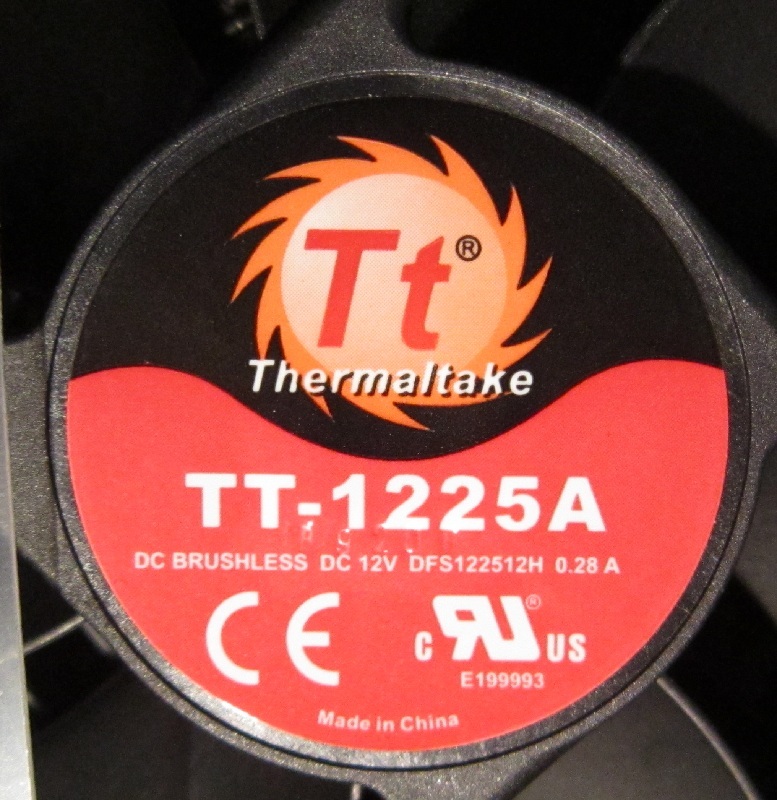 Thermaltake thoughtfully provides a list (with photos!) on their product page. I’m thoughtfully putting it here so you don’t have to count the cables in my pictures. Pretty decent selection for a 730 W unit. 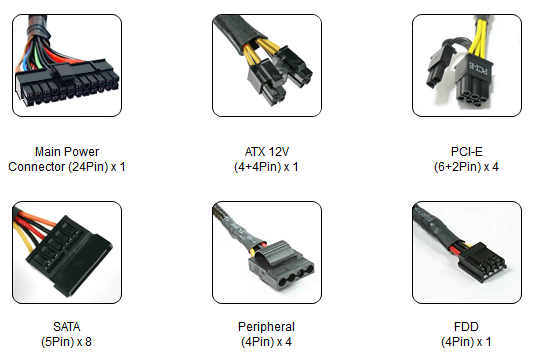 Plenty of PCIe cables, that’s a plus as many 750 W units only have two for some strange reason. 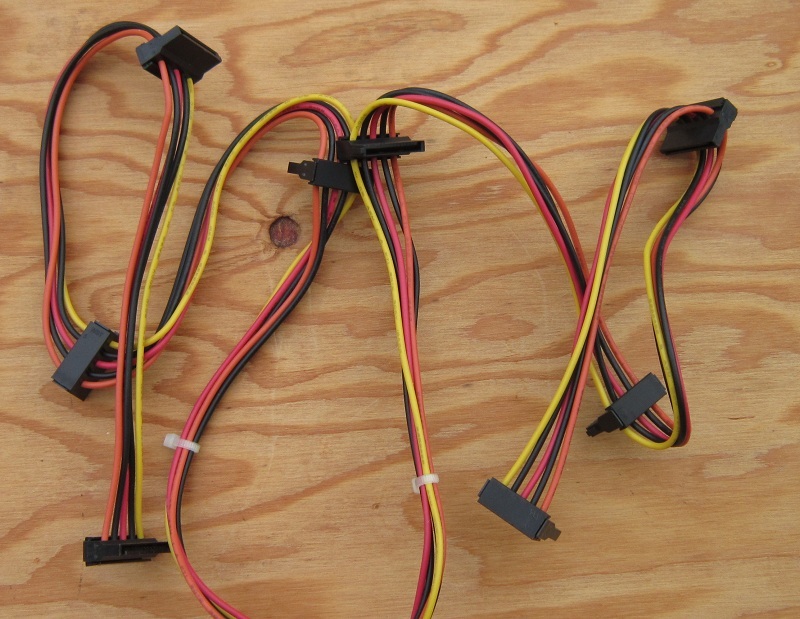 Four Molex connectors, a FDD connector, and eight SATA connectors round out the accessory bits. We have a 20+4P motherboard power connector and a 4+4P CPU power connector. Perfect. The pictures above aren’t actually of this specific PSU though. For pics of this unit, scroll down. Sleeving exists only on the motherboard cable, this is unfortunate from a looks standpoint. The +2P of the PCIe power cables could use one more cable tie to keep the second +2P somewhere in the area of the 6P it goes with. Not a huge deal, but annoying. Lastly, we have the accessories bundle. 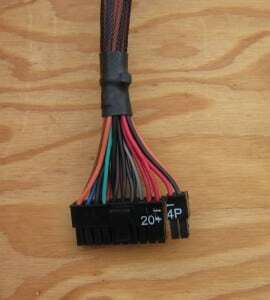 This consists of a power cable and four screws. It’s not the best accessory pack in the world, but it’s far from the bottom. If you stray too far into the budget PSU world, you don’t get a power cable or screws! Time for testing! That’s where things get real. As you’ve probably noted the bottom line there aren’t numbers. 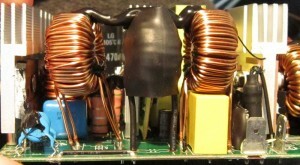 This is because at the max rated temperature of 40 °C the PSU would shut down when the final 48 W of 12 V load was applied. If removed it would happily turn right back on, but no matter what connector I put the load on, it wouldn’t take it. It would accept 760 W of load if I put the rest on the 5 V and 3.3 V rails so it wasn’t OPP. Given the numbers Tt specs give for OVP/UVP it wasn’t that either. 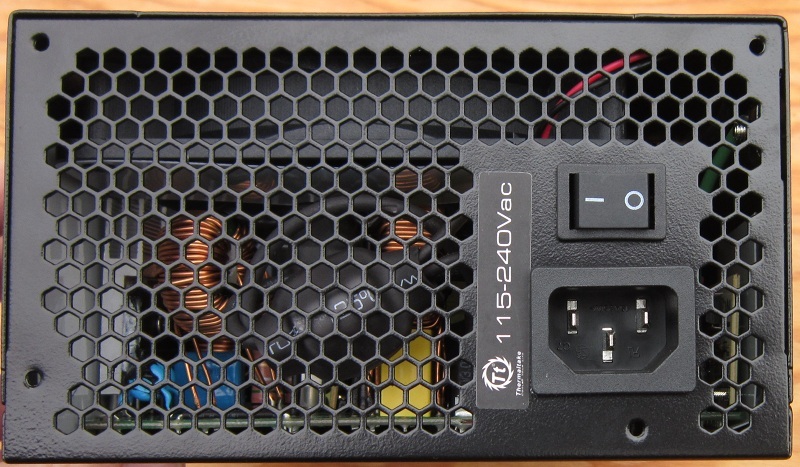 12 V OCP it is! On the plus side, this implies that it won’t explode if overloaded. On the negative side, it’s a ~620 W 12 V unit rather than the 672 W 12 V the box and PSU claim. On the matter of regulation, this is clearly a group regulated unit. It doesn’t appreciate crossloads overly much, but does significantly better on them than some units I’ve seen. The 12 V rail comes in at 4%, the 5 V rail comes in at 5.5% and the 3.3 V rail comes in at 8%. 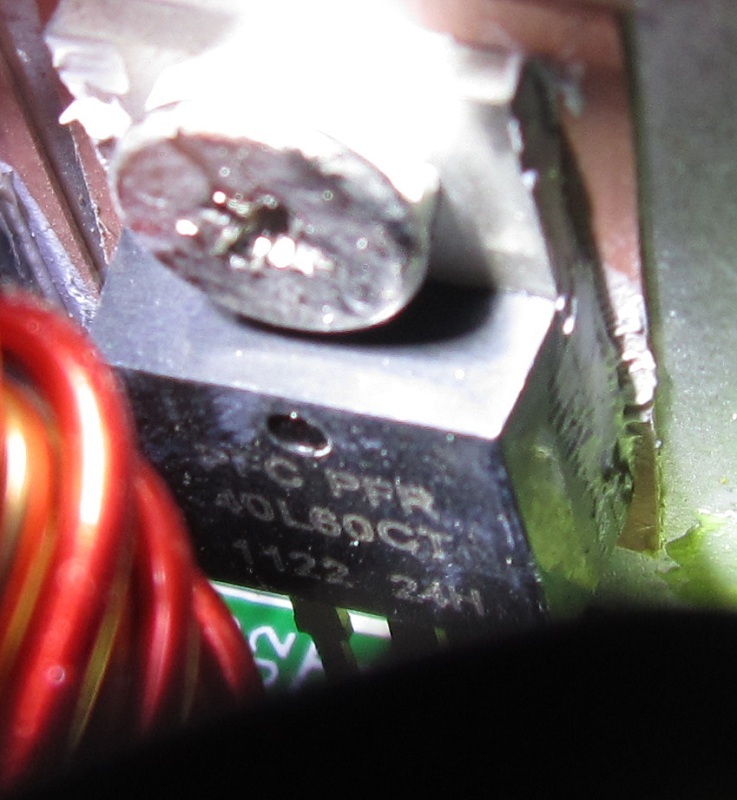 If I chuck the extremely rude crossload result for the 3.3 V rail, it gets 6.3%, which is better but still pretty bad. On average (throwing out the zero 3.3 V load result) we have 5.26% regulation. Not terrible, but not exactly good either. On the plus side the unit can cough up full wattage at 40 °C for a sustained amount of time, and the fan is on the quieter end of things even at full load and 40 °C. We’ll start at zero load and cold temperatures and work our way up from there. In all shots the scope is set to 5 ms / 10 mV. 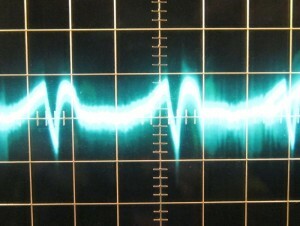 The 12 V rail looks excellent, the fan’s motor coils firing are the cause of what little ripple there is. 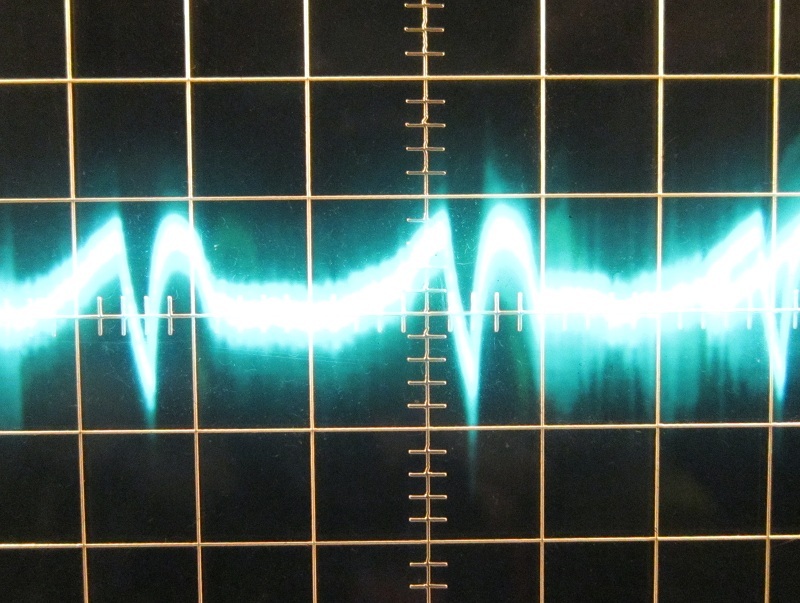 Interestingly, the same is true of the 5 V and 3.3 V rails! I locked the fan so it couldn’t start, no ripple. Allowed it to turn and the ripple came back. Weird, but whatever. 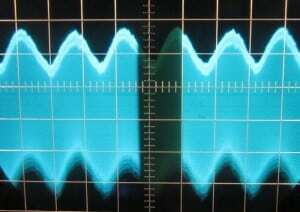 6 mV is great for 12 V. The 5 V and 3.3 V results are OK. Zero load is a dubious test though, let’s try 100% load. 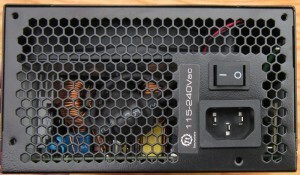 48 mV on the 12 V real is good, well below max spec and better than some units that cost a lot more. 22 mV on the other two rails is pretty good, too. 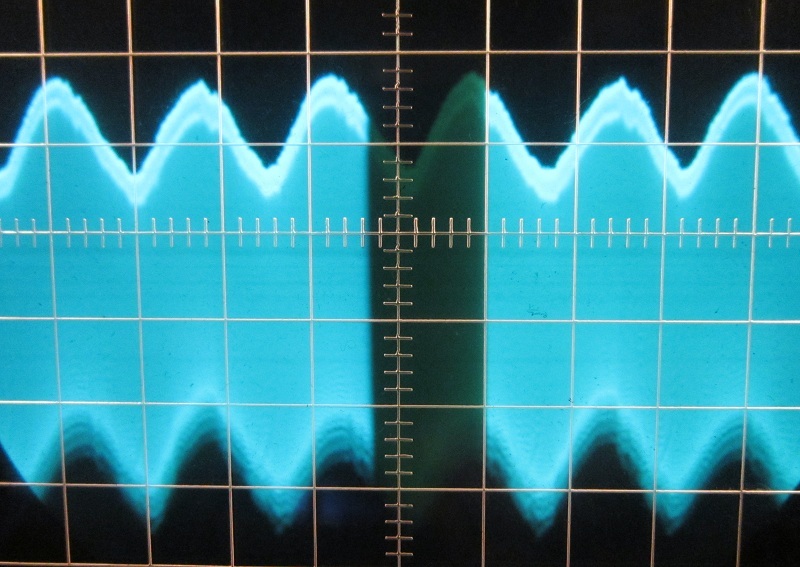 The shape of the 3.3 V ripple is very strange indeed, I have no clue what’s up with that. Now with a very heavy 12 V crossload, still cold intake temps, scope still at 5 ms / 10 mV. No issues here, all three rails are right around 50% of the maximum spec, that’s just fine. Now for some hot results at full unit load. 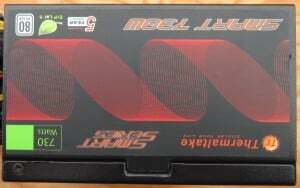 With the unit hot, the 12 V rail has the same amount of ripple, the 5 V rail drops 1 mV and the 3.3 V rail drops 5 mV. Other than that pesky 12 V load shutting the unit down when hot, this unit is happy there. 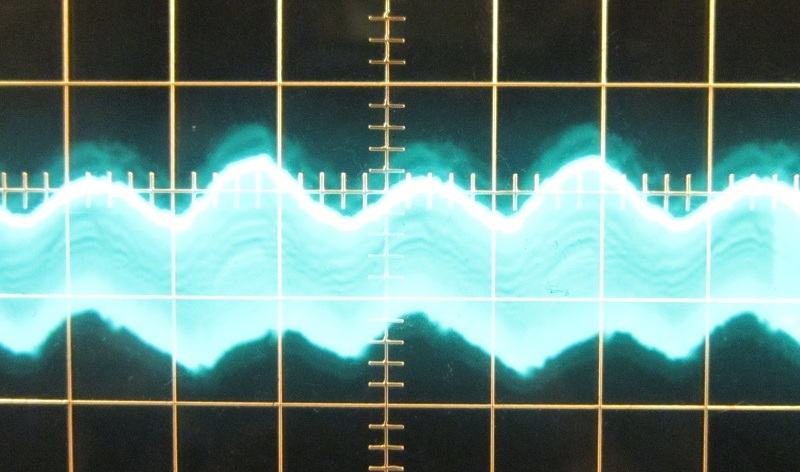 All told for this section, ripple control is good. No issues here at all. First up, the fan hub and an overview of the interior, much like I saw when I definitely didn’t open this unit at home. The fan connector was glued, this is a nice touch. 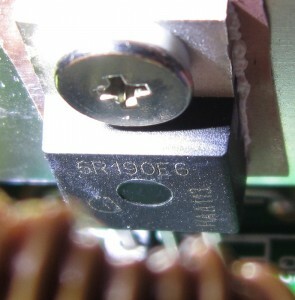 Also nice (for me at least) are the spade connectors for the incoming wall power. 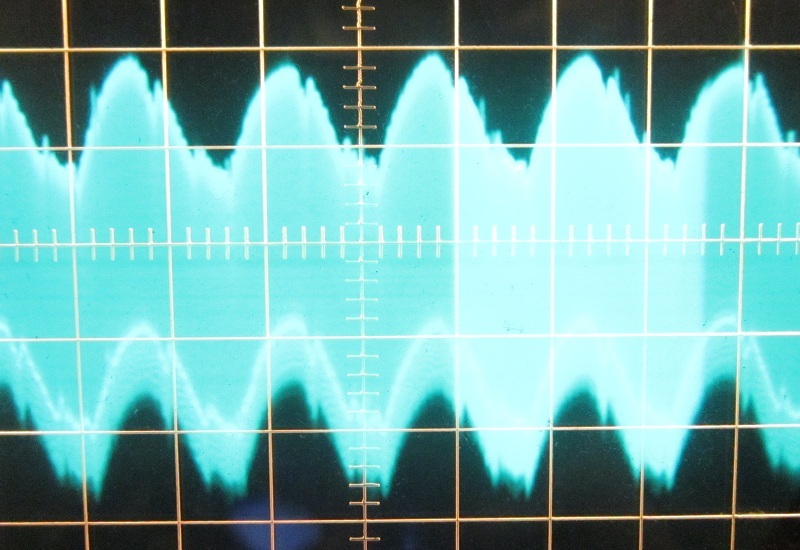 The only thing really of note we’ll be seeing next in the transient filter section anyway. I’ll talk about it there. 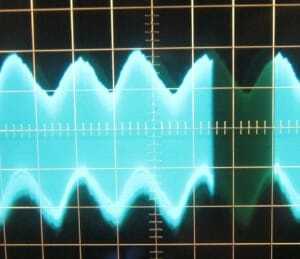 Welcome to the transient filter section! 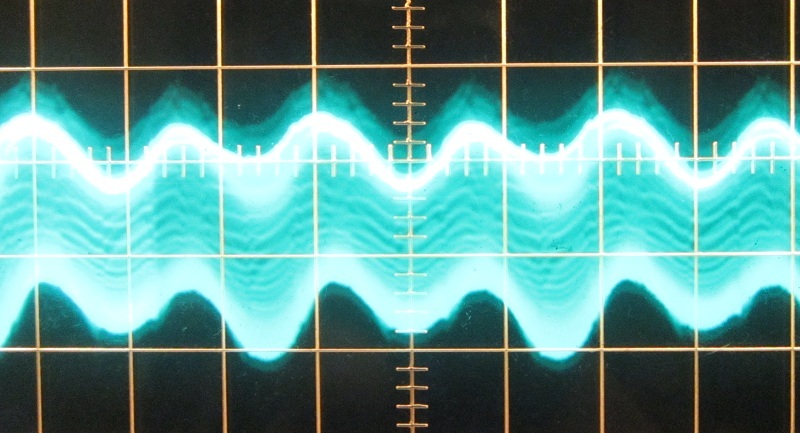 The transient filter mops up the generally messiness of the incoming wall power and restores a nice clean sine wave. 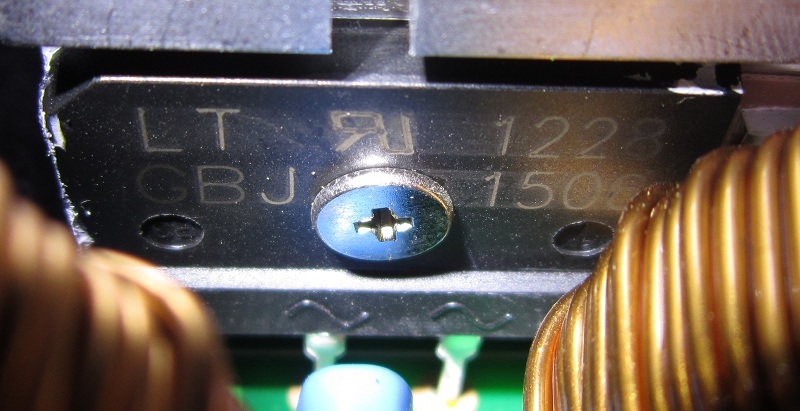 It starts at the receptacle with a PCB that has two Y capacitors and an X capacitor, then it continues on the main PCB with three inductors, a fuse, a TVS diode for surge protection, two more Y capacitors and another X capacitor. See the inductor on the left? It’s leaning rather heavily! 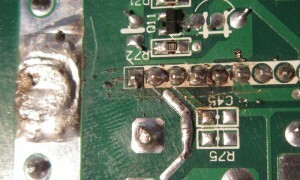 Based on the glue across the top (for stability and noise control) it looks like it was initially in the correct place. Sometime after that something happened. Either it got dropped in shipping or someone grabbed the wrong bit of it. Which one it is, I can’t say. It worked fine bent over like that though, it doesn’t matter electrically. 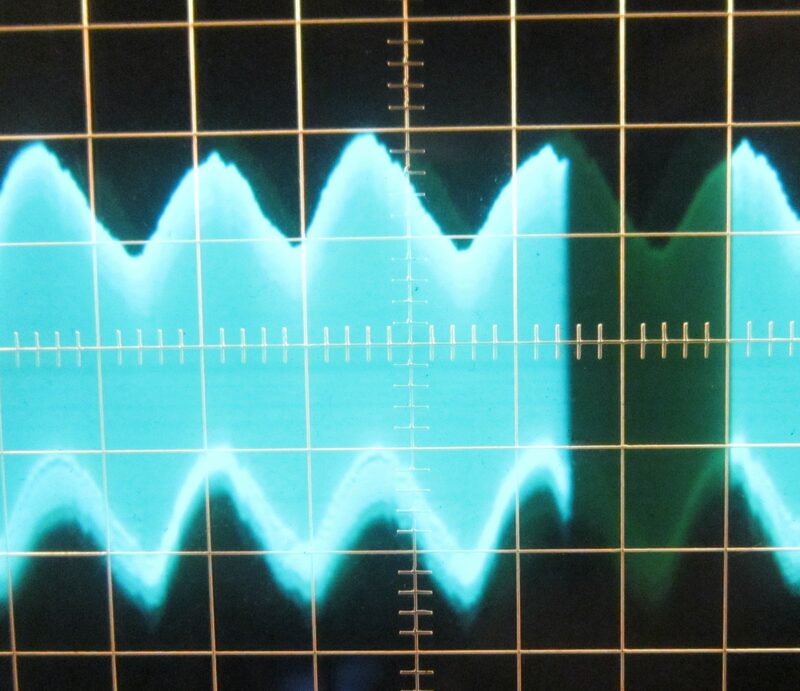 The transient filter is nice and complete, no issues here. Next up we have the APFC section, it starts by rectifying the incoming AC to DC and then boosting it to ~380 V and stashing it in a nice big fat capacitor. 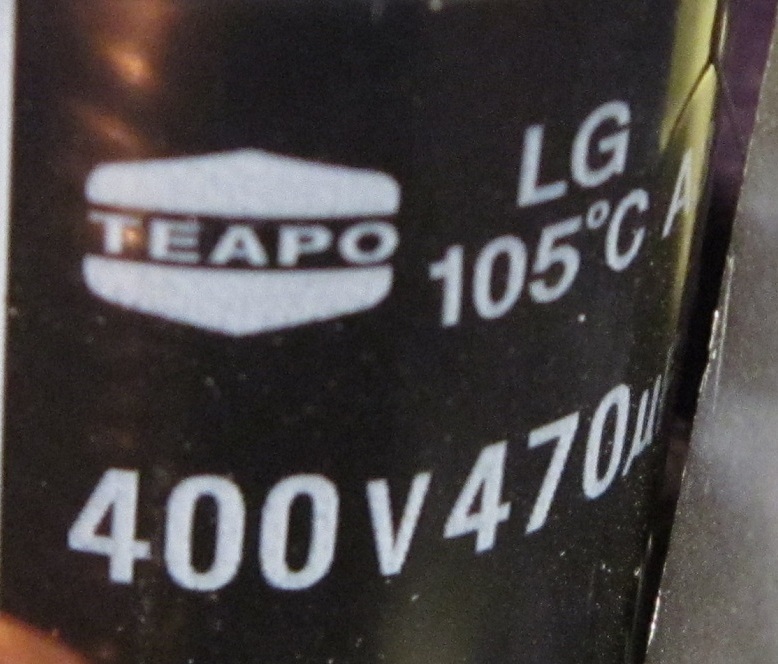 This is the capacitor that can lay you out if you open a PSU. 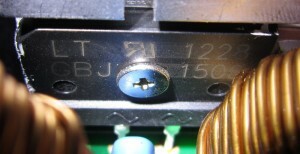 The rectifier is a GBJ1506 (15 A, 600 V). There are three MOSFETs on APFC switching duty, all three are 6R190C6 (20 A @25 °C, 13 A @100 °C, 650 V) units. 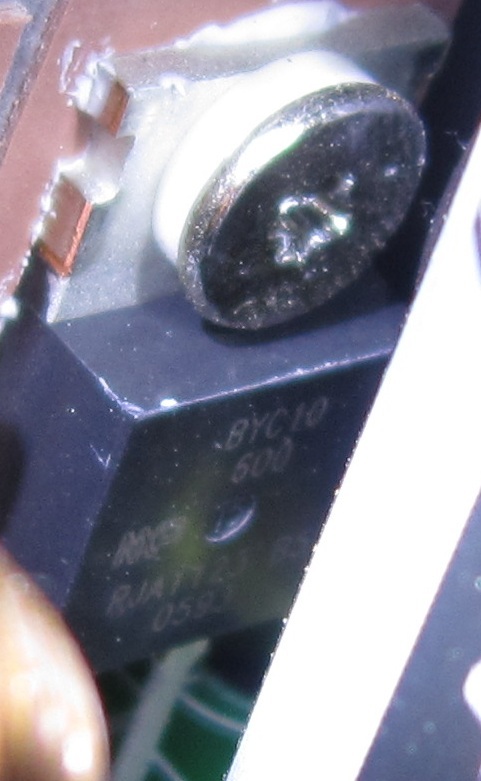 The boost diode is a BYC10600 (10 A, 600 V). 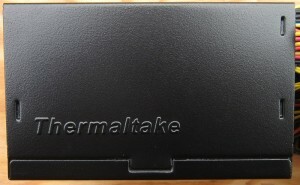 The storage cap is a Teapo 400 V 105 °C unit. 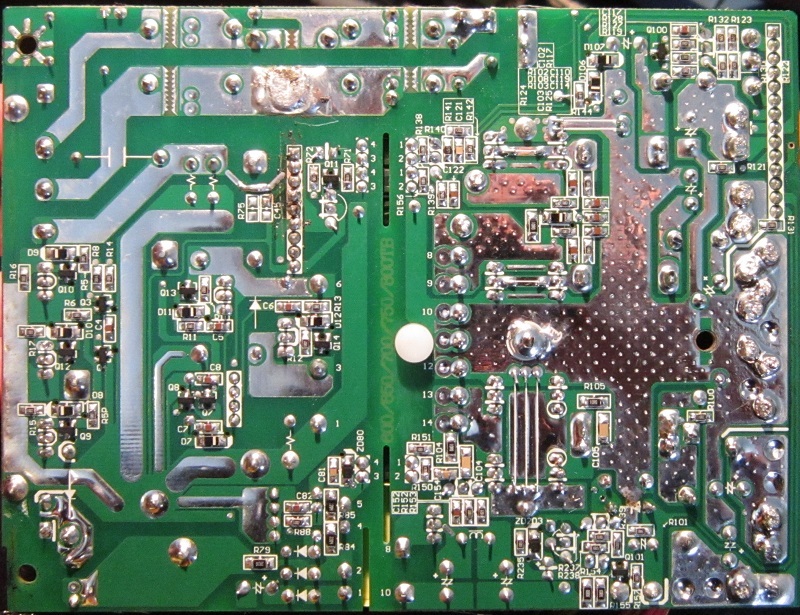 Controlling the operation is a FAN4800IN APFC/PWM controller. As you can see above, the two primary switches are more 6R190 MOSFETs, these are E6 rather than C6 for whatever that is worth. 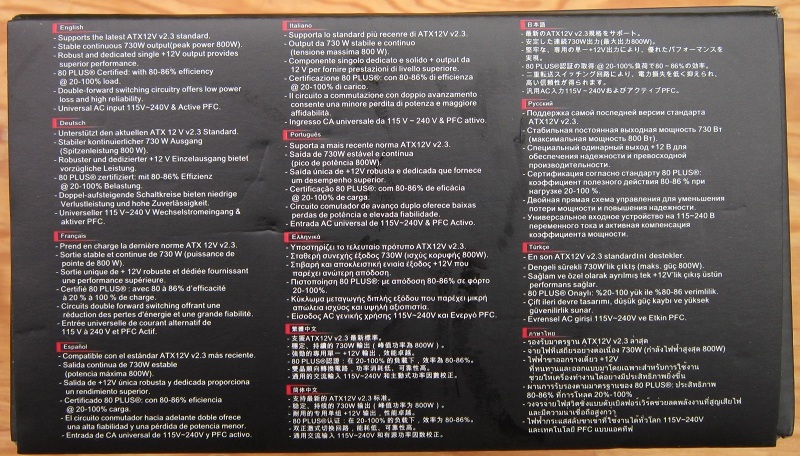 The voltage and amperage specs remain unchanged. 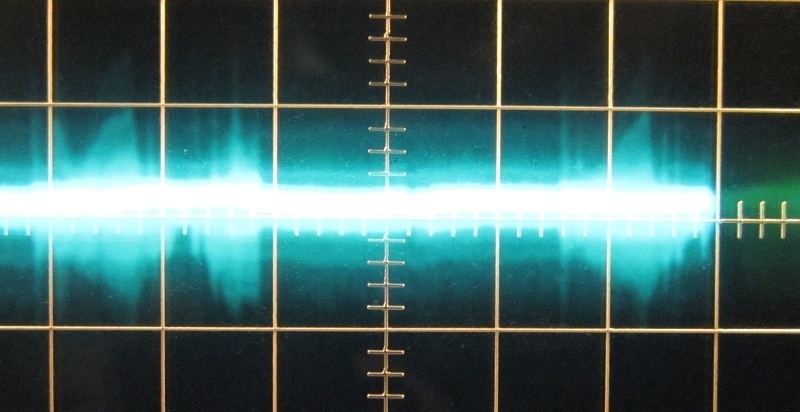 On the secondary side, the 12 V is rectified by four 40L60CT (40 A, 60 V) Schottky diode packs, while 5 V and 3.3 V each get two 30A40CT (30 A, 40 V) Schottky packs. Output capacitors are all 105 °C Teapo parts. People like yelling at Teapo due to the issues in the early 2000’s on Dell motherboards (and some others). In PSU situations, Teapo caps work just fine. 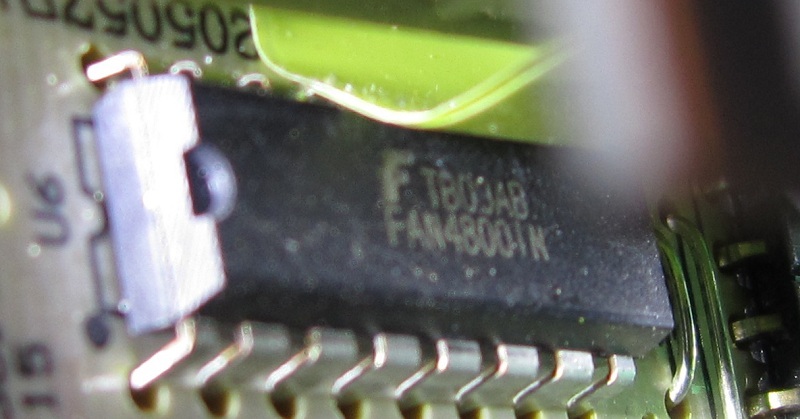 The PCB is short on UL numbers, it looks like a HEC / Compucase piece. 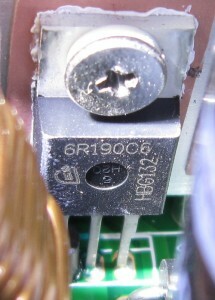 The case has UL number e199442, which links to Compucase. That answers that question! 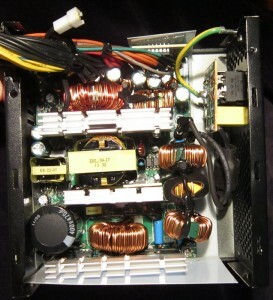 Interestingly, this appears to be a dual rail PSU. 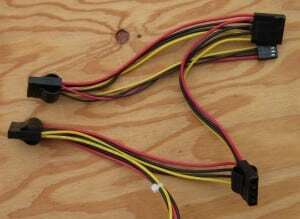 Not only are there two colors of 12 V wiring, but the PCB is marked for 12 V 1 and 12 V 2, and beyond that the PCB has sensing bits and traces that lead to the PS223 protections IC. The PS223 (not a 232, I guessed wrong. 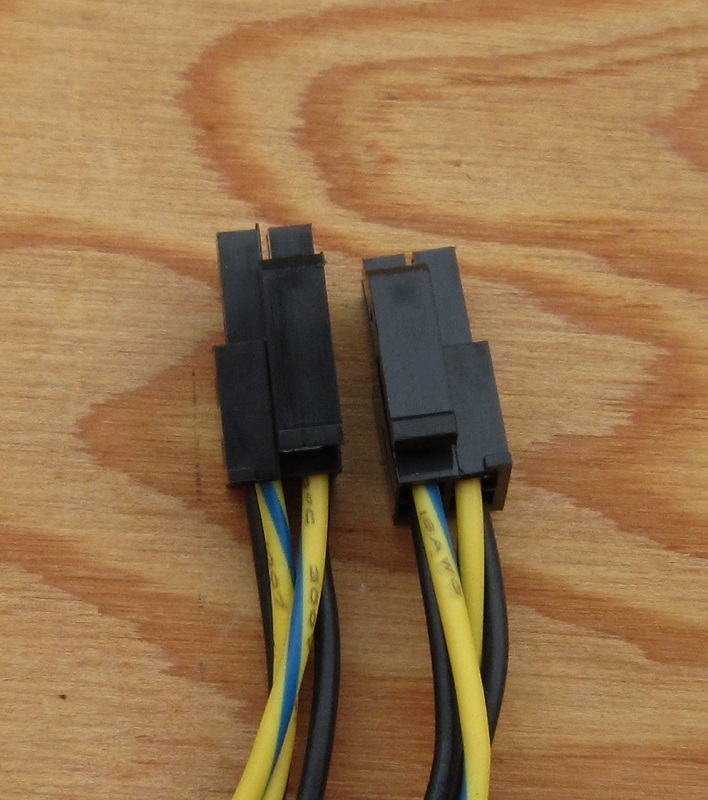 Same protection trip points though) supports two 12 V rails, making this a dual rail PSU. It’s not often we see a dual rail marketed as a single rail, that’s new and different. I’m happy to see it, really. I have no idea what the rail sizes are. 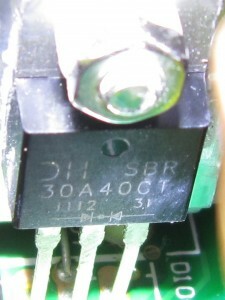 I did re-test the unit after finding this, the shutdown when hot issue does not appear to be related to the dual rail nature of the PSU. Lastly, the overall soldering is good, but there is one place where a sloppy technician had to do some manual work and didn’t do a very nice job of it. All together this is a solid looking unit. 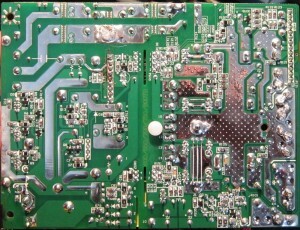 I could do without the soldering messiness of course, but that’s a fairly minor issue. 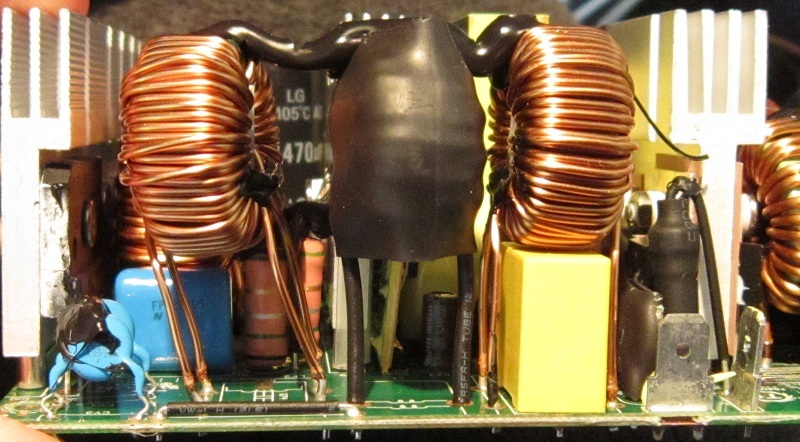 The leaning inductor is odd as well, but it’s more of a non-issue. The multiple 12 V rails is strange, but I have no issues with additional safety measures! I’m just surprised Tt didn’t put it on the label. 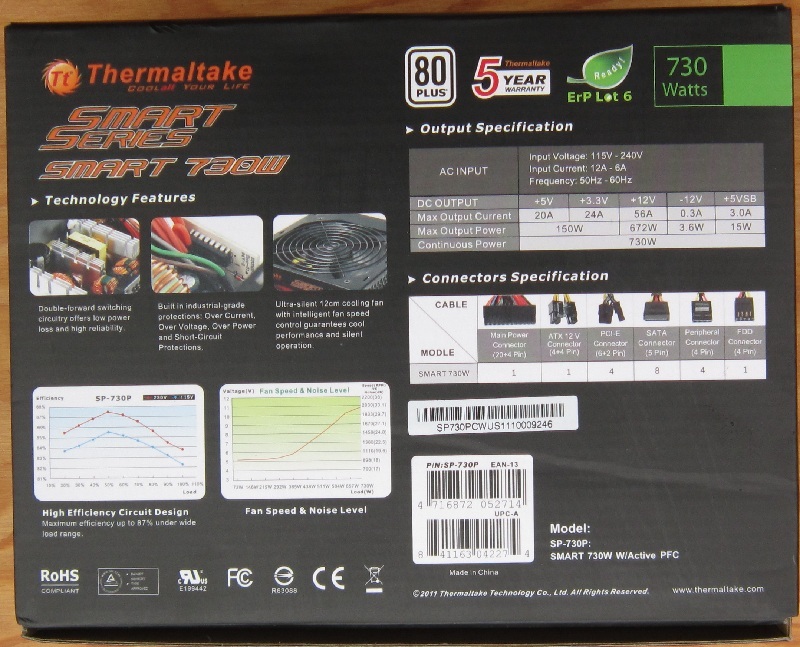 Coming into this review Thermaltake’s “Smart” PSUs have been on a pretty bad streak lately, this unit is doing its best to end that streak. 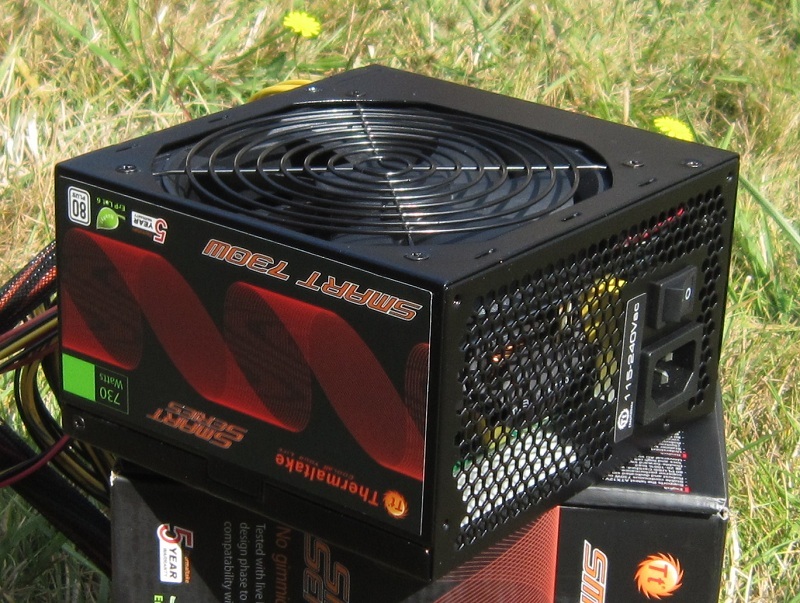 It’s not a PSU that I can hold up to the sky and proclaim to be the best of all possible PSUs (I’ve yet to find that one), but it’s a solid unit. The looks are decent. 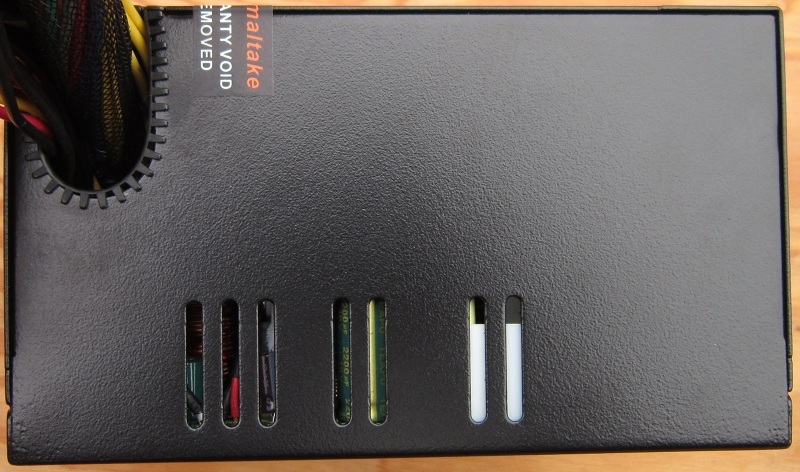 The case itself looks nice, but the un-sleeved cables offset that. The PCIe cables really need one more cable tie to keep them under control in my opinion. The connector selection is good, there aren’t many 750 W units that have four PCIe cables. It seems to me like they all should, but many (most?) do not. This unit has four, that’s a point in its favor. The fan is quite polite, at low through medium loads it’s very quiet and even at full blast it’s not bad at all. The regulation is OK. I was extra-brutal in the regulation tests (for a group regulated unit, anyway), and it survived them with everything within spec. Things swing around in the good old fashioned group regulated way, but it stayed within ATX specifications at all times. On one hand I’m impressed by that given the group regulated design, on the other hand 6% average regulation isn’t exactly good. Worse though is shutting down at the maximum 12 V load (672 W) when hot. I’d much prefer that it shut down rather than run in dangerous territory, but doing what the label says would be better. At cooler temperatures it does that load just fine. I did some additional testing and found that the line was crossed at ~30 °C intake air. 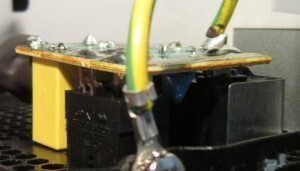 Below that point it could put out the 12 V the label says it can, above that it shuts down. If I decreased the load to 624 W, it ran happily. This can’t really be taken as anything but a failure however, if it cannot do 672 W at 40 °C the label should not say it can. On the plus side, we have two 12 V rails rather than the single on the box. I dislike the marketing fail, but I do prefer two rails to one rail. Ripple control wise this unit did quite well, no issues there at all. At a current retail of $85 this unit is priced a bit high. It currently comes with a $25 mail in rebate to offset that, but I’d prefer they just knocked $10 off the price. It’d be a good price at that point. As it is, it’s competing with 700-750 W 80+ Bronze units. At $75 it would be surrounded by 400 W to 600 W units and would be a good deal. At the bottom line, as much as I would like to approve the unit I just can’t quite do it. 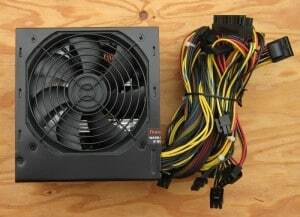 The combination of a price that is $10-$15 too high (in the $70-$75 price bracket this would be a monster) and shutting down at a load / temperature combination the marketing says it can do prevents me from approving the unit. In the $85 price range there are a couple better choices. If you happen to find this unit on sale, go for it! Its largest problem, really, is that it’s on the outdated end of things. That’s okay if the price is great, but the price is not great. 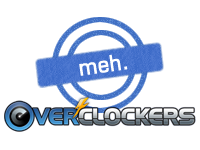 As such, I’m forced to apply a Meh rating. Click the Meh to see exactly what it means. Really wanted to be able to approve this. Just couldn't quite do it. Tragic really. The whole SMART series would be so much more approvable if they were a bit cheaper. Then I don't understand why don't do they just lower the price on them. You get more money if you sell 100 units for 54.99 than if you sell 10 units for 79.99. 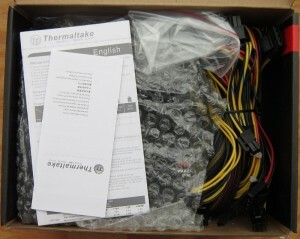 Thermaltake isn't overly involved with these units, they don't design them or manufacture them. It may be that having to buy the design and buy the manufacturing eats so much of the profit that there wouldn't be any at $55. 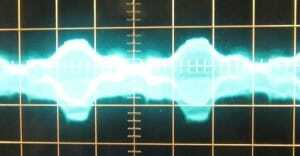 I'm not sure whether Tt is involved in R&D on the specific loadout of the design (cap choices, inductor choices, MOSFET choices, etc.) or not. If they aren't I bet larger part of the profit is staying with the manufacturer and Tt can't drop the price. Do note that this is all guesswork. 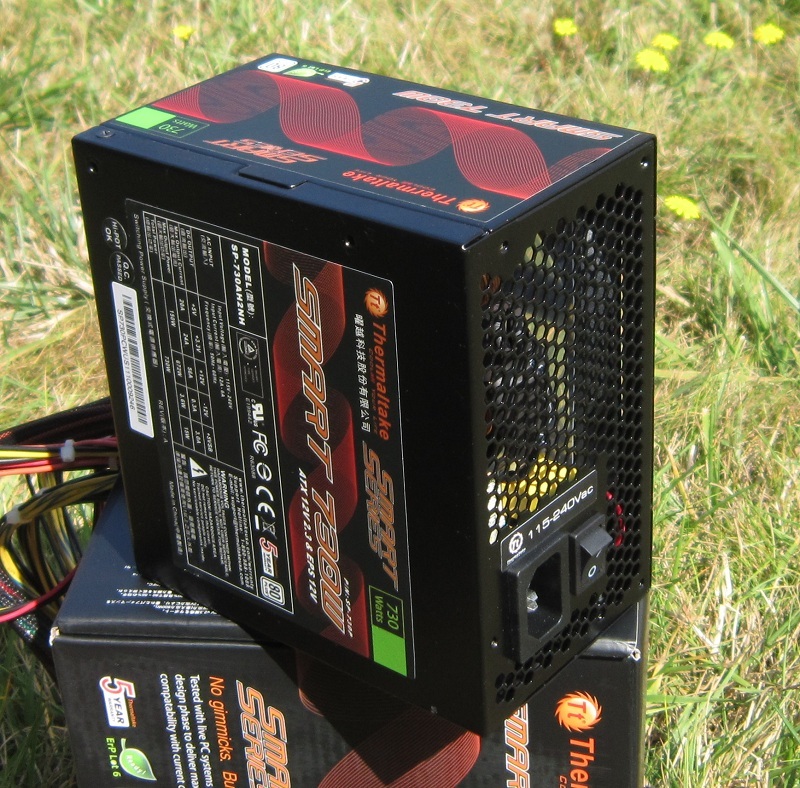 Also note that Tt makes (or sells with their label, anyway) some very good PSUs. These just aren't them. 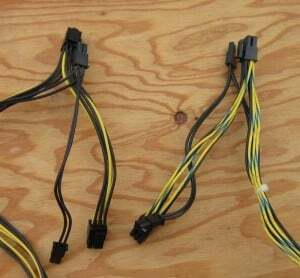 Haven't tested any Corsair PSUs at all. If they send 'em, I'll test 'em. Bob is it correct that Seasonic and Corsair are made at the same factory? That's what i have been lead to believe. Not correct. 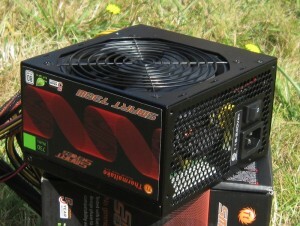 Also, not really the proper thread for talking about PSUs other than this one and competing models.